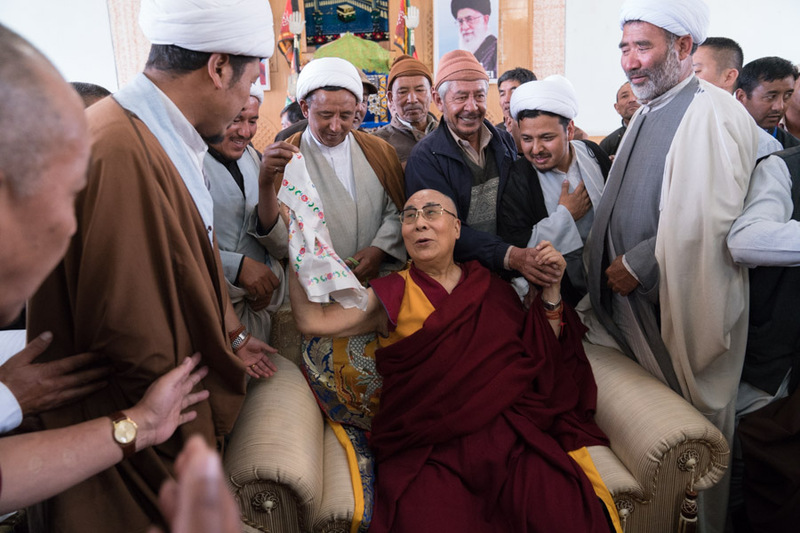 (TibetanReview.net, Jul29, 2016) – On his second day in the Ladakh region of the Jammu and Kashmir state of India on Jul 27, Tibet’s exiled spiritual leader, the Dalai Lama, visited two Muslim mosques besides a Buddhist monastery in the regional capital Leh. He first visited the Jokhang Temple to which he was escorted by the presidents and office-bearers of the Ladakh Buddhist Association, the Ladakh Buddhist Youth Association and the Ladakh Buddhist Women’s Association. Inside the Temple he was received by Thiksey Rinpoche, Ladakh’s the Chief Executive Councilor Dr Sonam Dawa, MLA Nawang Rigzin Jora, other political leaders, and members of the General Council of the Ladakh Buddhist Association. The Dalai Lama joined the gathering in a couple of prayer recitations and said that temples should be not just places of worship but must also centres of learning. He emphasized that in order to be a complete Buddhist one should have good enough knowledge of Buddhism, including its philosophy and other teachings of the Buddha. After Jokhang Temple, the Dalai Lama walked for some 50 metres away to visit a Sunni Muslim mosque built in 1666-67 reportedly under an agreement between the Mughal Emperor Aurangzeb and the Ladakhi King Deldan Namgyal at that time. He was received by the president and other leaders of local the Sunni Community who held a prayer service. The Dalai Lama next walked some 200 metres away to visit a Shia Muslim mosque where he was received by the president of the local Shia community and a number of Shia clerics. Besides, representatives from the Sunni and Buddhist communities also joined the gathering in the prayer hall. The Shia community president recalled that this was the Dalai Lama’s third visit to the mosque. Addressing the gathering, the Dalai Lama said that during the Fifth Dalai Lama’s time in independent Tibet, land was given to a group of Ladakhi Muslim traders to enable them to build a mosque, thereby marking the establishment of the Tibetan Muslim community there. Representatives of the Tibetan Muslim community had since then participated in all Tibetan government functions. He noted that the Muslims in Tibet were a very religious community characterized by gentleness and peacefulness. “There were no records of quarrel among them. They always had beautiful stories to share. They were true followers of Islam,” he recalled.